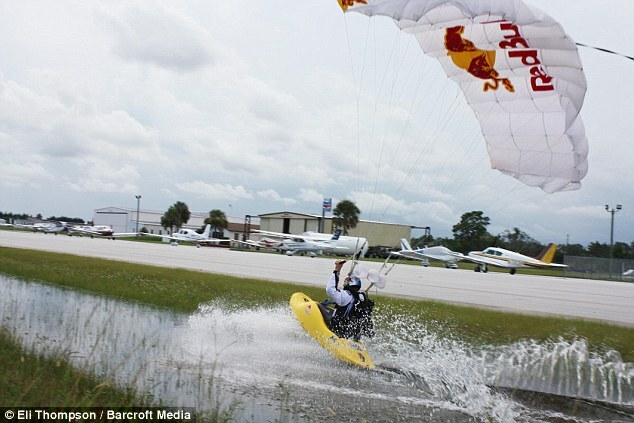 But the answer will become clear when Miles swoops in at 50mph and lands on the water in spectacular fashion. His unbelievable antics are set to explode onto the worldwide silver screen in a sensational new 3D film on skydiving, base jumping, wingsuit flying and skyaking. The 40-year-old, from Twin Falls, Idaho, decided to put a twist into has favourite pastime when looking for new ideas to take it even more extreme. And as these pictures 13,000 feet over beautiful Lake Tahoe show his efforts are both incredible and hilarious. ‘It took us nearly a year before we could get our wish to come true as no-one was really looking to throw a kayak out of an aeroplane. Static lines connect the jumper to the point they are jumping from – such as a plane or in Miles’ case the bridge – and automatically pulls their parachute as they fall away. He continued: ‘A year later I got permission to jump out of an aeroplane and so since that time I have jumped out of four different aircraft, including a helicopter. Over the years father-of-two Miles and his team have slowly perfected the art of skyaking. ‘There are a lot of things that can go wrong in skyaking and so you have to be prepared,’ he said. ‘In skyaking I usually put the chute quite high. With skydives I will pull at 2,000 ft above the ground whereas with skyaking I will pull at 5,000 ft above the ground incase anything starts to go a little crazy. 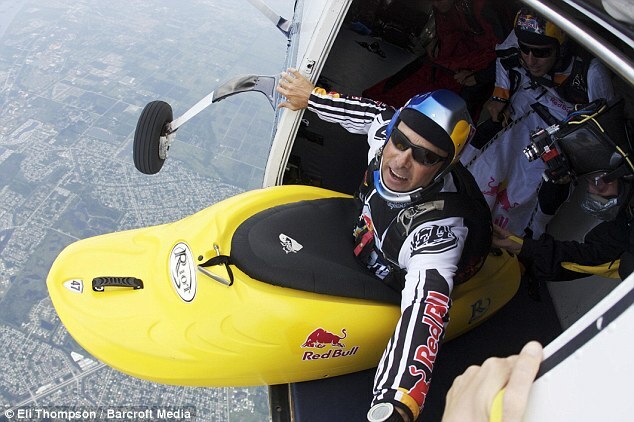 ‘That way I have a time to sort things out, get out of the boat and then pull the chute for the kayak.’ And he has noted some strong differences in regular skydiving. ‘The rate at which you fall is a lot different,’ he said. ‘Instead of falling flat on your belly you are sitting up right in an L position. I liken it to sitting on a space hopper, balancing front to back and side to side. ‘It does take some decent balance skills. And because the boat has such a big surface area your fall rate is a lot slower. ‘If you are lying on your belly, a normal sized human will fall at 120 mph. ‘If you go into a stand up or a head down then you can build the speed up to 160-180 mph. ‘But with this boat, that has so much surface area and weighs 35 lbs, meaning that I fall at only 98 mph. 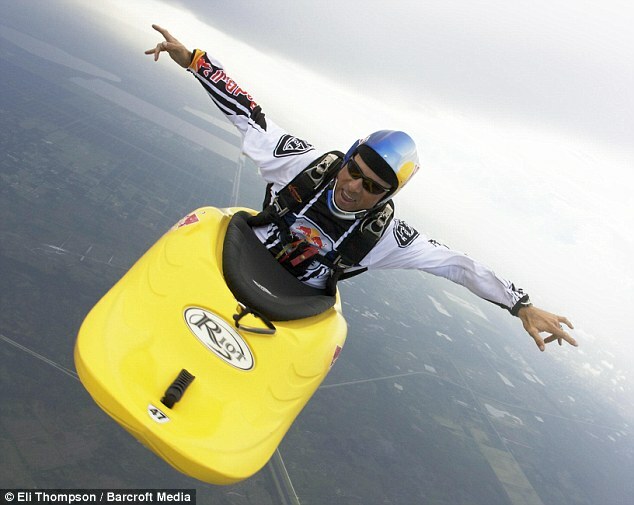 The reduced rate of Miles’ descent through the clouds means that cameramen wishing to film him need to wear special wingsuits to increase drag and reduce their own fall rate – so they don’t just hurtle past skyaking Miles. 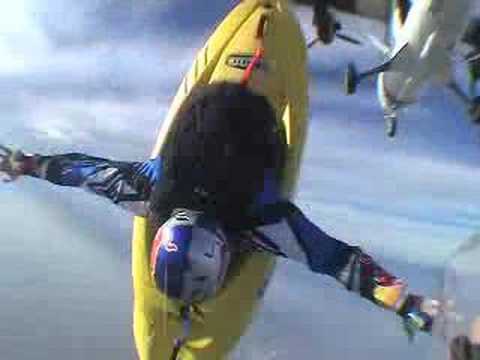 Wingsuits are specially adapted bodywear for skydivers and base jumpers. Flaps of material running across the gaps between arms and legs increase drag for jumpers and allow them to glide like a flying squirrel. Danger-hungry Miles has completed more base jumps than anyone in the world with 2,570 and has completed a whopping 3,000 skydives since he quit his job and took up the sport in 1995.